The differences between being a child in postwar Britain, a parent in the 1970’s, and a grandparent today are amazing to me. When I was a child there were still shortages of food which meant essential supplies were rationed while luxuries were just none existent for the ordinary family. This made for a simpler diet with few choices and little chance of overindulging. However, undernourishment was such a big issue for children at the time that the government provided orange juice, cod liver oil, malt extract and often a tonic like Minadex for every school age child. Babies and schoolchildren were given free milk. Food was basic, grown, fished or farmed, and home cooked. There was very little processed food and no such thing as ready meals! Packaging was practical and simple too. Butter and cheese was cut off a large block and wrapped in greaseproof paper then put in a brown paper bag. Sugar, flour and dry goods were scooped out from large sacks, weighed and poured into paper bags. Fresh fish was bought straight from the quayside or from a man who brought it round the houses in a horse and cart. Bread and pastries were usually baked at home or bought from the local baker, while meat was from the local butcher and chickens were often still alive! Every town had a High Street which had a selection of specialist shops and there were ‘corner shops’ in most residential areas. In fact when my grandfather left the army in 1952, he bought a corner shop right next to the hospital off the West Road in Newcastle. Some shops, like Woolworth’s, were quite large, but nothing like the huge supermarkets of today. Women, and it was almost always women, had large sensible shopping bags, which were used over and over again. Plastic bags had not been invented. Often the shopping was delivered to the housewife in a cardboard box by a lad on a bicycle or a man in a van. This was essential as working class women, or indeed men, would not have had a car. We have gone full circle here as so many supermarkets deliver shopping now, but not for the same reason! But to get back to childhood, babies as far as I remember were dressed and treated as babies until they were about 3 years old. They would be put in a big pram and stuck outside in the garden or yard, or often, on the street outside the front door. Here the child would sleep or watch the world go by for hours between feeds with a few toys. My soft toys would have been knitted by my mum while my dad would occasionally make wooden toys. Toys, being few, were treasured. I still have the doll I had when I was 1 and the golly (sorry) my mum knitted when I was 4. Boys would often have tin cars or lead soldiers, both of which would be considered dangerous now. Today things are so different. Babies are socialised and stimulated from the earliest age. 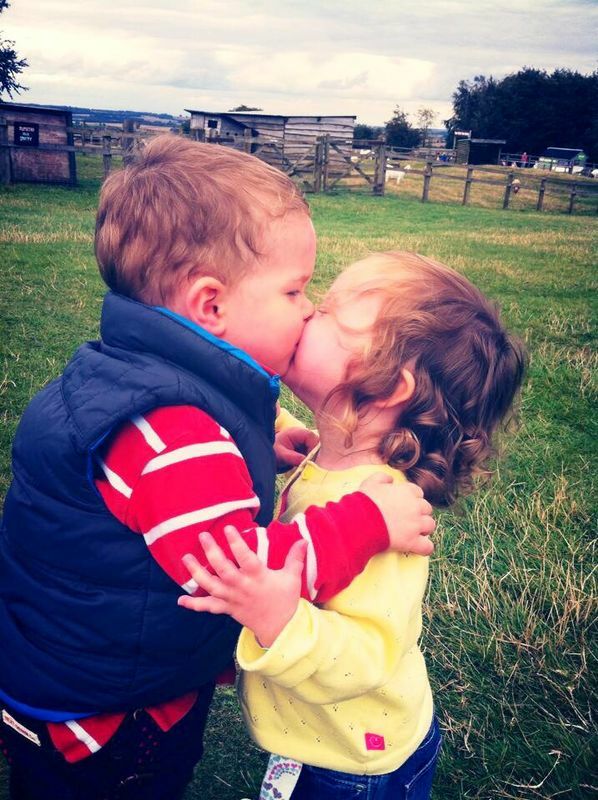 My grandchildren are taken to ‘bounce and rhyme’, baby gym, play barns, swimming classes, baby massage etc. etc. It amazes me to see the speed of their development. And at home the range of toys is breathtaking. Everything seems to have movement, music, colour and lights built in. Even books have appropriate sounds alongside the story. And, before babies can even crawl they have play mats like the one in my photo. This 3D mat has all the colours of the rainbow in it. It is based on a jungle theme so there are animals adorning it. It is soft, safe, supportive and stimulating. It plays a variety of music, animal noises, and even waterfall sounds. It has given my grandchildren hours of pleasure. I chose this photo for a couple of reasons. It shows my two and a half year old grandson teaching his 8 month old sister how to roll over. It is so cute and the clothes just tickle me. Denim jeans on a baby I find hilarious and absolutely adorable. So this week’s photo challenge was to illustrate the colours of the rainbow and I think this photo does that. 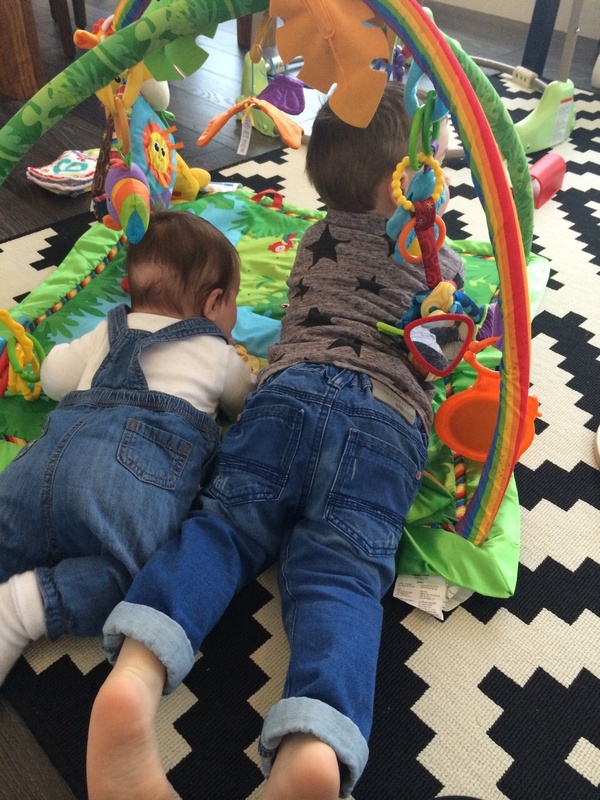 The denim jeans qualify as Indigo while all the other colours of the rainbow are in the playmat. but just in case you want more I have added a little group of colourful shots below. Goodness I have been down memory lane again with this weekly photo challenge In fact I went through various stages ~ philosophical ~ historical ~ scientific ~ photojournalistic ~ spiritual and ended up just reminiscing. I have included a 3D photo of my youngest granddaughter afloat in her mother’s womb and a beautiful photo of a good friend afloat on Taung Tha Man Lake in Myanmar (Burma), which I did not take but have permission to use. So here are my offerings for the theme Afloat! This photo captures a fleeting moment so fulfils the brief for this week’s photo challenge. The definition of the word ‘ephemeral’ is ‘fleeting, transient, short-lived’, and for me that epitomises childhood. 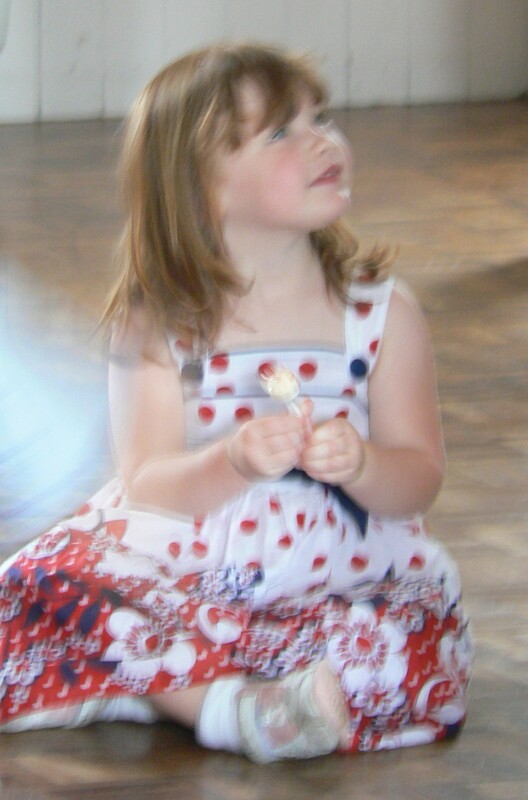 This is a photo of my granddaughter at her third birthday party, which was 6 years ago. The blurred quality expresses the fleeting nature of childhood I think; so brief it is to be treasured. But it also brings to mind the word, ‘ethereal’, and captures what I think and feel about children in general, and my grandchildren in particular. Children are such precious, fragile things; innocent, trusting and dependent. They seem to belong to another, more heavenly world. She is just one tiny child, but ‘she is a child of the universe, no less than the trees and the stars’, and she has a right to be here. Like every child she also has other rights:~ to love, shelter, health, education, equality, protection, and to be treated with humanity, respect and compassion. I worked with children all my life but now that I am retired my time, energy and funds are limited. However I have found one small, local charity with minimal administration costs that punches well above it’s weight in working with children who are less fortunate for one reason or another. It is called Hands Around the World and I would urge you to click on the link, find out what they do, and see if there is anything you could do to support their work. Or look them up on Facebook if you are a member. This week was half term for the local schoolchildren. As often happens, the weather, which had been mild for February, decided to turn nasty, wet, windy, and very cold. Now I know from my daughter who is snowed up in Vermont that we have nothing to moan about in the Cotswolds, but I did feel sorry for the families who had planned to have days out during the holiday. 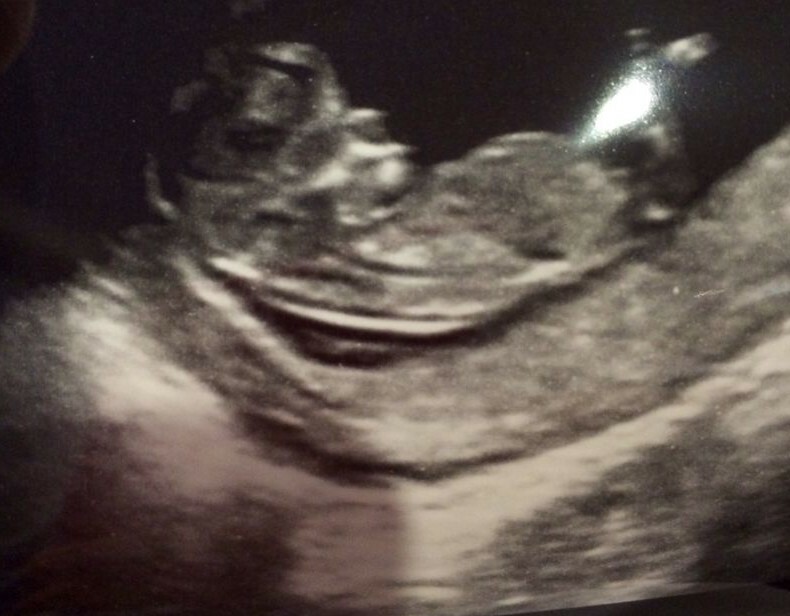 As I take my grandmother duties very ‘seriously’, I had planned all sorts of exciting things to do with my own adorable grandchildren. There are lambs being born at the farm park, there is a baby rhino at the wildlife park, and the woods are full of snowdrops. Oh what fun we could have ~ if it would only stop raining! Undeterred we opted to go to Lydiard Park early to see if we could have some fun. Having never been there before I decided to let the SatNav direct me. This caused great hilarity as I had set it to stay off the motorways and we ended up on some of the tiniest country lanes with the weirdest names. We made up a game of seeing who could find the funniest or strangest name. I kid you not we found a house called Tadpole cottage, at the end of Tadpole Mews, in Tadpole Lane in a place called Tadpole Garden Village! It is a new village built on the site of… you guessed it…. Tadpole Farm! At last, and in a very cheerful mood, we reached our destination. Lydiard Park is a beautiful historic estate in Wiltshire. Back in medieval times, there was a deer park and manor house on the land as well as St Mary’s Church. The estate as we see it today dates back to Elizabethan times and was owned by the same family for over 500 years until 1943. There is a beautiful Palladian House, the medieval church and a restored walled garden, set in 260 acres of parkland. In the grounds there is a lake, woods, sweeping avenues which are great for walkers and cyclists, and a superb ice house. Despite the rain we had a great time. 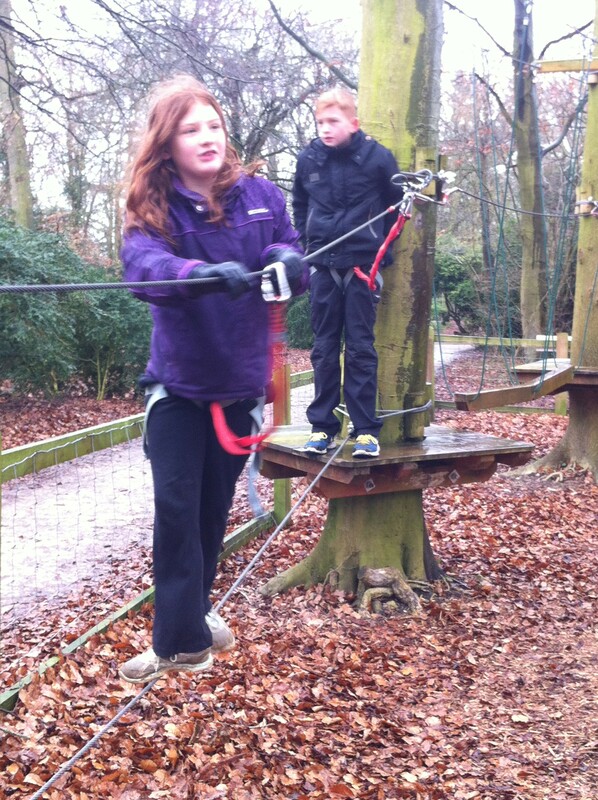 The children braved the treetop adventure course which has over 50 hair-raising activities including zip wires, cargo nets, Tarzan swings, see-saws, rocket slides, wobbly logs, and tree trekking. We warmed up and drip-dried in the café drinking hot chocolate before setting off to take photos of the snowdrops and the ice house. I wanted to use my photos for the Weekly Photo Challenge but I really am not sure that I have the skills. I could blame the weather, or my iphone camera but really I just haven’t understood the Rule of Thirds. I took some photos of my garden hellebores and tried to crop them to the rule of thirds. Did it work? Do let me know how I could improve. Many years ago, it seems like another lifetime, I was a busy single mum to 4 wonderful children. I had a full time job that I loved, a nice home that was all my own work, an adorable miniature wire haired dachshund and a stray cat who turned up one day and stayed for 17 years. Over the years I progressed from teacher to deputy head and then Headteacher of a great primary school at the heart of an estate in my adopted home town. Luckily my profession fitted in perfectly with being a single parent as I was usually around in school holidays and always at weekends. But if ever there was a crisis due to illness or something I had the backup of my mum who lived nearby and was always delighted to look after the children or pets! My school and parish was my community and together with my family, was the source of all the joy, friendship and social life I needed. Although I knew my immediate neighbours, my life was much too busy to get involved in the local community or the people in the wider neighbourhood. And so life went on and my children became adults and gradually left home. I had always encouraged them to follow their dreams and take any opportunity they could to travel and sample other ways of life and other cultures. I was lucky enough to travel extensively through my job, working with schools in Russia and Africa. I also took great holidays in America, Canada and many parts of Europe. So I think I probably went a bit too far with this advice as now 3 of my children live and work abroad! As my children grew more independent I filled my spare time travelling to Lourdes at every available opportunity as a volunteer/helper with the sick or disabled whom we called VIPs. This was one of the most rewarding 10 years of my life. It also indirectly brought me my wonderful second husband who was also a volunteer. I knew that I was very lucky in every way and I worked very hard to try and improve the life chances of the children in my school. But of course life has a way of turning your world upside down sometimes. For me several events occurred to produce the perfect storm that would shatter my well ordered life. I buried my feelings and worked harder and harder until my body refused to do any more and I had to retire. There then followed 5 very gruelling years which felt like 50 years. I was caring for my mum who was disabled after a heart attack. I only ever went out of the house to shop or for their hospital appointments. I became reclusive, antisocial and anxious. By 2009 my life and social circle was as limited as it could possibly be. Then in that Autumn my youngest daughter said some women wanted to start a WI in our area. She said she thought it would be good for me so she would go with me to the inaugural meeting. It took all my courage to turn up that night and fortunately there were only a handful of women there. In fact there were so few that almost everyone there ended up on the committee by default! My daughter said I was good on computers so could be the secretary. Now, almost 4 years on, I know that joining the WI was the best thing I could have done. At first I forced myself to go to all the meetings as I had to take notes. Gradually it became a pleasure to attend the meetings and I looked forward to them. I joined the Book Club and started reading again. I started putting my name down for trips and events. To give me the courage to turn up for them I took my camera to hide behind and became our unofficial photographer. I ventured out to concerts and big events like the AGM in Cardiff. It still takes quite a lot of courage for me to attend these things but I know that if I am struggling I will not be alone. The friendship and support WI members offer each other is very special. I even joined the Public Affairs Committee at our Federation. Usually I find that the speakers at meetings are so interesting that I completely forget to worry or panic and just enjoy myself! Now the WI is my community and my family. Through joining, I have rediscovered my creative side, writing a blog at http://www.heavenhappens.wordpress.com I have become outgoing and physically active again and renewed my interest in campaigning. Best of all, when I walk anywhere in my local area now I seem to know everyone and they all stop for a chat. I feel that I am part of a vibrant and supportive community. The WI offers all kinds of opportunities to all kinds of women. I would advise any woman of any age to join and get involved to whatever extent you feel able. The WI is all about inspiring women. It is a rich source of experiences, knowledge and skills passed down through generation ~ and updated every day! WI even enriches my now rare holidays, as I try to pop in to a local meeting while I am away. It is fascinating to see how different WIs conduct their meetings. But I can honestly say that whichever WI I go to, I know a warm welcome is guaranteed. I am so happy with my life now and I thank God every day for my wonderful family, friends and community. Reflecting on the week ahead of me I am delighted but a little daunted by the prospect of amusing 3 children under 10 while their parents work. 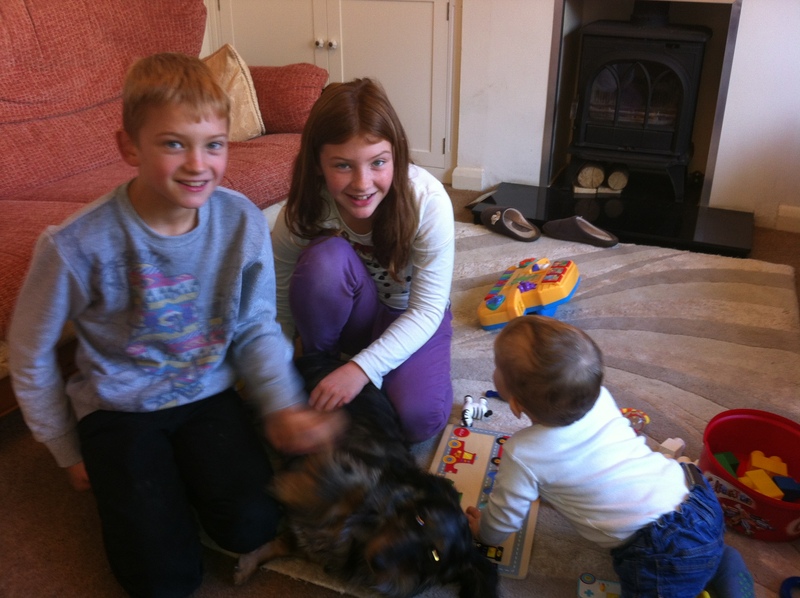 These are my adored grandchildren and I love them to bits, but will I have the energy to keep them all amused? Chekhov considered the work of an artist/writer, to be “the proper presentation of the problem”, so I tried to analyse the root of my anxiety. It became clear that I feel bound to stimulate and educate the grandchildren, while feeding them nutritious meals, sticking to their proper sleep patterns, keeping them clean and safe, and ensuring that they are happy and having fun at all times. When I consider these goals, I see that they are idealistic and possibly unrealistic given a) the British weather and b) my age and situation. So I cast my mind back to the things they have really enjoyed in the past and I realise that it is the simple things that bring the most pleasure. So we can put away the Ipads, Xboxes, Dvds and electronic games and instead get out the wellies and walk! Ring grandma’s doorbell and hear her dog bark. As we walk past the airport along country lanes. Lorries, trucks, buses, police cars and more. Of fish, bearded dragons, geckos, rabbits, snakes too. I can’t wait for tomorrow to do it all again.